Snow was falling as I began my hike towards Hollowell Park on a typical March morning in Rocky Mountain National Park. March being the snowiest month in Rocky Mountain National Park makes it one of the best times of year to photography winter like conditions. The willows along Mill Creek had turned a beautiful crimson, red and orange and the falling wet snow had only made the colorful willows standout against the white background even more. 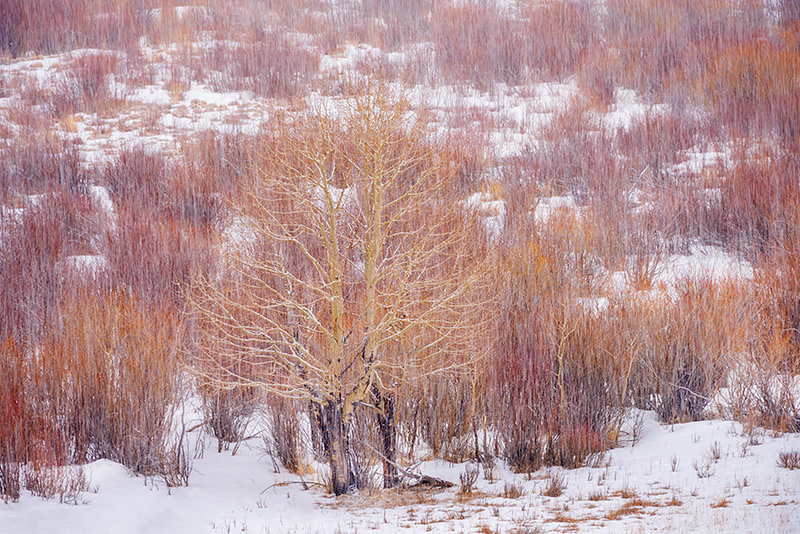 With this one aspen tree acting as an offset to the the large swath of willows, I climbed a hillside and photographed all this beautiful color while the snow fell on the landscape. It was an amazing morning to be out in Rocky enjoying the weather. Photo © copyright by Thomas Mangan.